The 1.42 million-year-old metacarpal from an ancient hominin displays a styloid process, a distinctively human morphological feature associated with enhanced hand function. 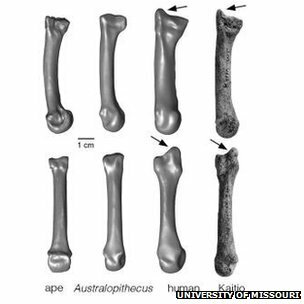 Its discovery provides evidence for the evolution of the modern human hand more than 600,000 years earlier than previously documented and probably in the times of the genus Homo erectussensu lato. The styloid process helps the hand bone lock into the wrist bones, allowing for greater amounts of pressure to be applied to the wrist and hand from a grasping thumb and fingers. Prof Carol Ward and her colleagues note that a lack of the styloid process created challenges for apes and earlier humans when they attempted to make and use tools. This lack of a styloid process may have increased the chances of having arthritis earlier. Prof Ward, professor of pathology and anatomical sciences at the University of Missouri, Columbia, said: "The styloid process reflects an increased dexterity that allowed early human species to use powerful yet precise grips when manipulating objects. "This was something that their predecessors couldn't do as well due to the lack of this styloid process and its associated anatomy.